Chatter–less 6–flute design reduces vibration. 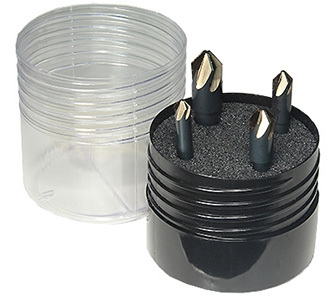 Multiple cutting edges extend tool life. Sizes: 1/4", 5/16", 3/8", 1/2" + Shank Sizes: 1/4", 3/8"
82° Countersink produce the ideal profile for the majority of flat head fasteners. A common use is to allow the head of a countersunk bolt, screw OR rivet, when placed in the hole, to sit flush with OR below the surface of the surrounding material (by comparison, a counter bore makes a flat-bottomed hole that might be used with a socket-head cap screw). Fluted countersinks come in several sizes, able to cut conical holes intended to fit screws of varying head dimensions. A pilot hole is first drilled for the screw, followed by countersinking the hole to allow a flathead screw to seat flush with the work surface.